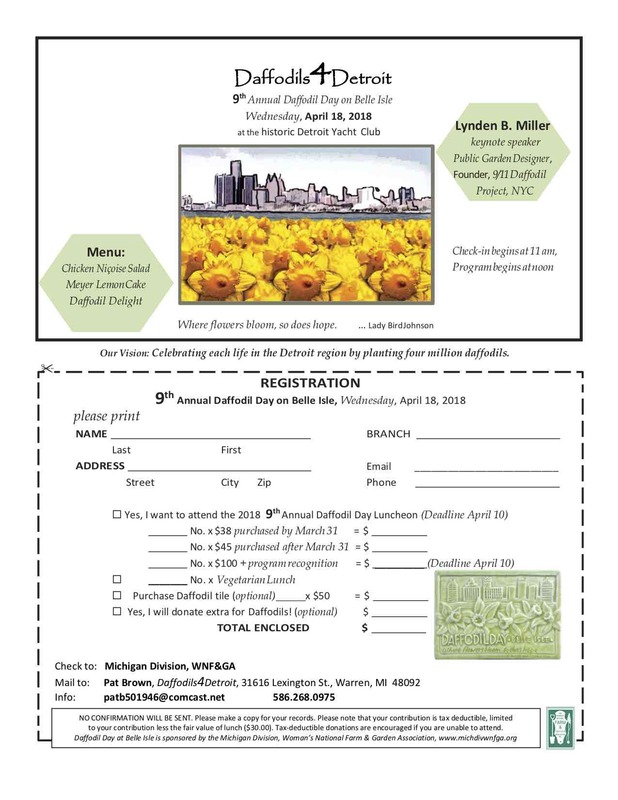 The Daffodil Luncheon on Belle Isle at the Detroit Yacht Club April 18, 2018. Tickets are $38 until March 31, $45 after April 1. See registration form below this article for more information. Yes! It’s time to think daffodils again! The Daffodil Luncheon will be on April 18, 2018. 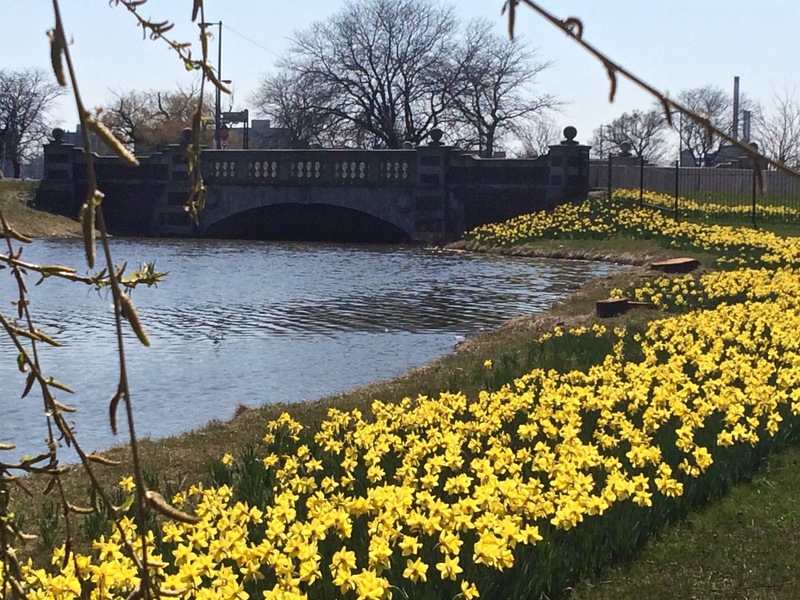 Timing should be perfect for 550,000 daffodils to welcome you to Belle Isle with their smiling, sunny faces. Highlights of the 2018 event include keynote speaker Lynden B. Miller, noted New York public garden designer. She was the spearhead of “The Daffodil Project” which began in New York after 9/11. That project was inspiration for our Daffodils4Detroit efforts. Ms. Miller will be hosted by the Bloomfield Hills Branch of WNF&GA. Our special attraction is the Belle Isle Nature Center Playground. This new playground complies with the Americans with Disabilities Act so all children can enjoy it. The Belle Isle Aquarium, Bell Isle Nature Center and Belle Isle Conservatory will also be open. The Luncheon, at the Detroit Yacht Club, will feature a Chicken Niçoise Salad, Meyer Lemon Cake, and a refreshing glass of Daffodil Delight. A vegetarian option will be available. Retail therapy includes botanically-inspired attire, courtesy of the Peacock Room and an opportunity to purchase the specially commissioned Daffodil Day tile. What’s new? Centerpieces! Rather than asking one Michigan Division branch to provide 45 centerpieces, nine branches will provide five each. The best part is the arrangements will be “loaners.” Those who provide centerpieces will take them home after the event. For more details about centerpieces, see information under the registration form below. Also new is the request for cheerful and friendly volunteers to act as venue and luncheon greeters. To help, please contact committee chairperson Robin Heller: RRheller@gmail.com. Daffodils4Detroit & Daffodil Day are sponsored by Michigan Division of the WNF&GA. Chairperson Robin Heller, Grosse Pointe Farm & Garden Club, has been busy leading the planning committee. Contact Robin if you want to become more involved. Special Note from Robin Heller: Underwriting donations will be a key to our continued success. Costs of planting have risen substantially in 2017. The three contribution levels are: Trumpeter ($500-$999), Golden Long ($1000-$4,999) and Double Golden ($5,000 plus). Please consider those levels for yourself, for your branch, for businesses you patronize, or for a shared gift from members of your family or a group of friends. Thank you for your continued support.